Translation, writes Sherry Simon, "poses the central question of ‘equivalence in difference’" (97). The translation of texts makes works accessible to a larger audience. It allows those of us who do not read German or Spanish, for example, to read Goethe and Cervantes. It gives us access to other literatures, other cultures. When we read a work in translation we expect a true rendition, as much as possible, of the original text even though we are aware of the difficulty of capturing the nuances of the original language. This paper discusses Antonio D'Alfonso's Avril ou l'anti-passion, published in Montreal in 1990 by VLB , and its English counterpart Fabrizio’s Passion, published in Toronto in 1995 by Guernica. What is interesting about these two texts is that, contrary to what one might expect, the English version is not a translation in the true sense of the word of its French counterpart. Indeed, the author acting as his own translator has taken liberties in rendering the English text which affect the content, the meaning and the interpretation of the English version when compared to the French. Furthermore, the results of this adaptation raise questions as to the author's/translator's motives and objectives for doing this. As Joseph Pivato writes in Echo, "the degree of sharing that results from linguistic and cultural translations alters the nature of the experience that is represented" (123). This is particularly true of D'Alfonso's Avril ou l'anti-passion and Fabrizio's Passion given that the author chose to publish an English adaptation of his original French novel instead of a straightforward translation. Essentially, the texts present the same narrative: Fabrizio Notte's quest for identity in a trilingual and tricultural environment. However, the specific language and cultural contexts that each inhabits makes the novel a different narrative experience in the writing, in the telling and in the reading. Why did D'Alfonso purposely choose to adapt rather than simply translate Avril ou l'anti-passion? Was he, in fact, trying to create a specific and distinct experience for himself as a writer as well as a distinct experience for his reader? Did he have ulterior motives for undertaking such a task? In an interview with Jean Royer of Le Devoir, Antonio D'Alfonso himself states that some chapters of his original manuscript were written in Italian, some in English, others in French, and others still in Latin. Consequently, before publishing the French text D'Alfonso had already engaged in a process of translation. In other words, the process of translation began prior to the publication of the "original" French novel and, by the same token, there was no need to translate some sections of the English "translation." Translation in Canada, writes Sherry Simon, is "a rite of passage, a process of transformation which guarantees passage from one identity to another" (96). D'Alfonso's modus operandi goes beyond this: he has chosen to follow a specific but unconventional path in the process of writing, translating and publishing these two texts, and by doing so he is illustrating more strongly what it means to be an artist who lives simultaneously in three languages, three cultures, three environments that cohabit one territory. In the following pages, I will proceed by pointing out some of the differences and particularities which exist between the two texts at the level of content, language, and regional (Quebec/Canada) identification. I will then discuss some of the consequences of such an approach, and conclude by suggesting the motivation for D’Alfonso’s venture. Although not immediately visible on the surface, a detailed comparison of Avril ou l’anti-passion and Fabrizio’s Passion reveals a number of significant differences. These differences include omissions and additions of phrases and sentences as well as oppositions or contradictions in meaning. In Chapter 5 of the English text, for instance, Fabrizio's parents warn their children that "the ‘others’ can do what they please because it is their home here" (62). Whereas this passage ends as such in the French text, the English text goes on to give direct dialogue: "‘Whatever it is you set out to do you must try to do it better than the others’" (62). In Chapter 4 of the French text, the narrator introduces a lengthy section on the history of Ville de Saint-Michel with these words: "Un peu d'histoire maintenant" (51). In the English text, the same section is introduced by giving the source: "I'm reading Histoire économique de Montréal published in 1942 by Les éditions J. E. Laurin . . ." (55). In Chapter 6, the narrator says that he does not belong to the world that he nonetheless participates in. His comment is followed by direct dialogue: the French text reads "Essaie de contrôler ta nervosité, me répète-t-on" (73). The suggestion being that people in general are repeatedly saying so rather than one specific person. In the English text, however, these words are spoken by the narrator's psychoanalyst, perhaps indicating the seriousness of Fabrizio's anxiety (i.e. he feels the need to seek professional help.) This difference in content suggests a more detailed, more educated, more knowledgeable narrator in Fabrizio's Passion. And whether or not the novel is considered to be semi-autobiographical, the changes in the English text indicate that perhaps the author has matured, gained new knowledge. The question remains, why did the author make these changes: to reflect his growth as an artist, to improve the novel by adding something more, to appeal to a different audience or simply to make it a different book? As mentioned above, some of the changes made to the English text constitute oppositions or contradictions in meaning with respect to the French text. These differences are sometimes as banal as Fabrizio's father letting his son drop "to the floor" (64) in English, but "sur le lit" (58) in French – not much of a difference unless you're the one who is dropped. In the section on the history of the city of St. Michel, the French text states, "En 1967, St. Michel compte plus de 70 000 habitants . . ." (53) whereas the English text reads "In 1959, Saint-Michel boasts a population of about 70,000 inhabitants . . ." (57). Is this discrepancy merely an oversight or does it have a specific significance which the author does not reveal? In Chapter 6 the narrator presents a scene from the classroom in which the students are asked to write on a specific topic. In the French text the topic is "le plaisir" (72). In the English text the topic is ethnicity: "Many students refuse to write honestly on the topic of ethnicity or on our ignorance in dealing with ethnic issues" (80). What is the significance of this difference? It is unlikely that elementary or even high school students in the late sixties/early seventies be asked to write on "ethnicity." I would suggest that the author's sensitivity to the ethnic question has increased from the time he wrote this section in the French text. And, because he wishes to make it more evident an issue in the English text, he includes it in the later publication. Although some of the contradictions may be oversights of translation, others such as the one just mentioned, convey a specific message or reflect the shift which has occurred within the author himself during the time period which separates the publication of the two texts. The characteristics of the language of publication account for differences between the two texts, and this results in a different experience in reading the texts. On a very obvious level, the fact that Fabrizio addresses his parents using the formal "vous" in the French text creates a distance and a degree of respect which are not present in the English text given the neutrality of the English "you." More significantly, the analysis of two chapters narrated by women illustrates how language is used by the author to maintain the ambiguity of the narrator's gender. The chapter on sexual abuse is a different narrative experience (for the reader) in the two texts and this is in part due to the gender neutrality of the English language. Chapter 14 is supposedly narrated by Lucia, Fabrizio's sister, but this is not confirmed until halfway through the chapter. The chapter consists of two specific narrative events: the first describes the narrator being sexually abused by her father; the second describes the same abuse by a neighbour. The narrator's identity, and specifically the narrator's gender, is a greater source of confusion in the English text: the details of both events lead the reader to infer that the narrator must be female but there is no other indication of this. Due to the characteristics of the French language, however, the gender of the narrator is indicated earlier on in the French text through the feminization of adjectives: for example, the narrator is "Déçue," (115) "paralysée "(115), "seule" (116, 117). Thus, the English chapter maintains the reader's doubt and confusion for a longer period of time than the French does. In the interview with Jean Royer, D'Alfonso admits that this chapter was written in English first because he wanted to maintain the ambiguity of the "I." The same consequences of language occur in Chapter 11 which is narrated by Leah, Fabrizio's lover: the French text immediately reveals the narrator's gender, again, due to the feminization of the language. For instance, Leah is "assise ici" (97), "résolument passive" (99), "franchement idiote" (100). In this chapter, however, the author chooses to reveal the narrator's identity early on by giving Leah's name. This is done in the English text but not in the French text. It would appear that during the process of translating this chapter, the author attempted to compensate for the ambiguity of the "I" in English. The author uses the characteristics inherent in a specific language to change the effect of his chapter. In the chapter on sexual abuse, the gender neutrality of the English language allows for the elements of doubt, suspense and surprise as to the narrator's gender. In the chapter narrated by Leah, these elements are missing in the English text because her identity is revealed, but they are maintained in the French text not on the level of gender but on the level of the narrator's identity. The French text, on the other hand, reads "je veux me muer en Québécois. . . . le Québécois est un héros à aduler" (63). These passages are particularly significant because the translation is true to the original except for the shift from "Québécois" to "Canadian." The main message remains, however, that the protagonist is attracted to the group in power, and wants to discard his Italianness in order to belong to the majority, be it Quebecois or Canadian. Given that the novel is about a young man's attempt to define himself within the complicated tensions of the tricultural environment which he inhabits, the substitution of "Canadian." for "Québécois" has significant consequences. There is a conscious effort on the part of the author to identify with the reader/society which the text targets. The French text seeks to identify with Quebecoisness, the English with Canadianness. Although the two texts present the same story, the changes mentioned above have an effect on the narrative experience in the writing, in the reading, and in the telling. First, at the level of the telling, the relationship between the narrator and what is narrated – the search for self – is distinct: being Quebecois as opposed to being Canadian. This distinction necessarily affects the level of the reading: as mentioned earlier, it is a question of the reader identifying with the main narrator and his quest. Finally, the relationship between the writer and each text is necessarily different given the changes which were put in by D'Alfonso himself. What does the existence of a novel and its adaptation, each of which targets a specific audience, say about the author? Some critics would respond that the author is giving the audience what it wants in order to increase sales, for example. Perhaps, but this is probably not the case for Antonio D'Alfonso. Instead, I would suggest that his work is a reflection of the individual who is a product of a tricultural society. 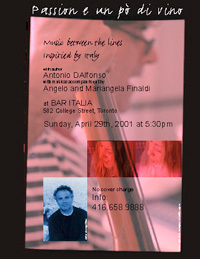 Antonio D'Alfonso, like his character Fabrizio, was raised in an Italian family in Quebec, a minority within a minority within the Canadian sphere. He has therefore experienced daily the tensions of living his "Italianness," his "Quebecoisness" and his "Canadianness" simultaneously. The publication of both novels reflects the shift in Antonio D'Alfonso's experience: Avril ou l'anti-passion is, as he calls it, his "love song to Quebec." It was written at a time when D'Alfonso wanted to belong in Quebec as an individual, as a writer and critic, as a publisher. The publication of a "more Canadian" novel, in the language of the majority, reflects his geographical move to Toronto and his disillusionment with Quebec. And, given that it has a larger audience, the English version gives greater exposure to the experience of the Italian raised in Quebec and in Canada. D'Alfonso, Antonio. Avril ou l'anti-passion. Montreal: VLB, 1990. ____. Fabrizio's Passion. Toronto: Guernica, 1995. ____. The Other Shore. Montreal: Guernica, 1986. Pivato, Joseph. Echo: Essays on Other Literatures. Toronto: Guernica, 1994. Royer, Jean. "La traversée des cultures." Le Devoir [Montreal] 20 Oct. 1990. Simon, Sherry. "Rites of Passage: Translation and Its Intents." Massachusetts Review 31 (1990): 96-109.